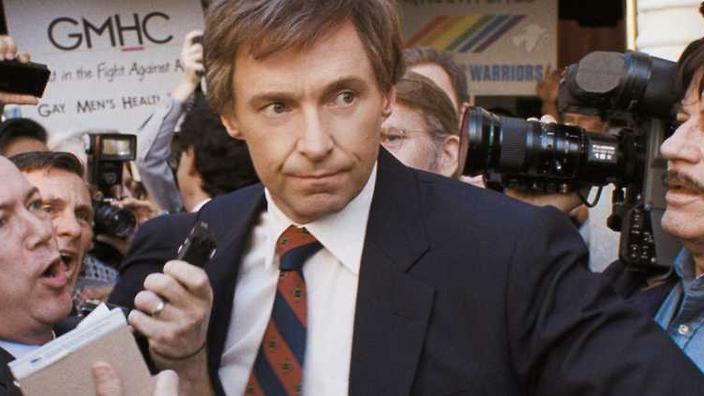 Hugh Jackman as Gary Hart in The Front Runner. By ever-increasing proportions, Americans claim to be disgusted by politicians. Yet we spend more and more time preoccupied with them, seeking out news of their personal improprieties and endlessly arguing about them on social media. What would we do for entertainment if we didn’t have them to hate? You hardly need me to point out the wretched state of public involvement with our elected officials, as bad as it has ever been in living memory. The new film The Front Runner sets itself the historical task of locating the turning point when things started down this path. That would be in 1987, when Ronald Reagan was at the end of an eight-year presidency that had divided much of the country. The expectation was that the pendulum would swing to the opposite extreme, to a president who was young, forward-thinking, and a Democrat. And that man looked to be Gary Hart, former senator from Colorado. Hart very nearly beat out Walter Mondale, the Democratic establishment’s candidate for the presidency in 1984, and by the next election it looked like the nomination was his for the asking. The shorthand explanation for why George Bush and not Hart became the next POTUS boils down to one name: Donna Rice, a young woman not married to Hart who was observed entering—but not leaving—his DC townhouse. Hart insisted that she was simply a campaign aide, but when photos of her perched on his knee during an earlier yacht trip surfaced, he abandoned his candidacy. But of course it doesn’t matter how much meat there actually was to the story (neither Hart nor Hill has ever admitted to any sexual impropriety). The lesson of the Hart affair was that if you can get a scandalous charge into the media mill, the jury of public opinion is seldom willing to wait for all the evidence to come in before rendering its verdict. Star Hugh Jackman initially looks uncomfortable under a hairpiece that does little to increase his resemblance to the real Hart. (Great hair was the one thing Hart had in common with Reagan.) But he captures the self-confidence bordering on arrogance that blinded Hart to the precariousness of his position: Wvery time he brushes off his aides’ attempts at damage control by remarking it will go away on its own—“The public won’t stand for it”—we marvel that there was a time when a political candidate actually thought so highly of the people he hoped to represent.